For Earth Day, I created hand-made paper from scraps of printer paper and brown paper shopping bags. 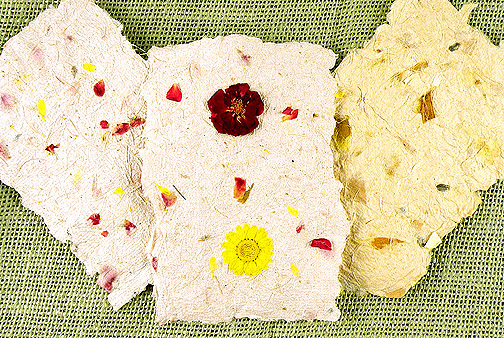 I embedded flower petals, leaves and flower seeds into the paper. This paper is the ultimate in reusing left-over items—it transforms waste paper into something beautiful and then it can be recycled again by planting it in the ground. You first need to make the paper screen which also acts as the form for the paper. This can easily be done with things you may already have on-hand. Once the screen is made, you can quickly and easily make paper whenever you want. This paper is a very kid friendly craft as well. This entry was posted in Crafts, Recycle, Uncategorized and tagged Gina Tepper, kids crafts, making paper, recycle paper, seed paper. Bookmark the permalink.